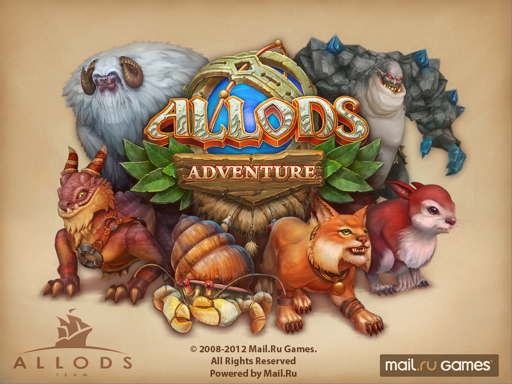 May be this one sounds familiar, yeah, if you knowing about an online game from Russia called Allods Online. This one is developed by them too. This game supports English, Russian, French, Italiano, and Deutsch languages. I haven't played the online version yet. As I know the online version we played as a human. In this one we will played as some different monsters. Alright, in Allods Adventure, we must defeat some enemies using 3 kinds of different monsters for each levels. I'm not sure what it called, but I will decide it into 3 category, green, blue, and yellow monsters. The monsters that we used have different skills and abilities too. 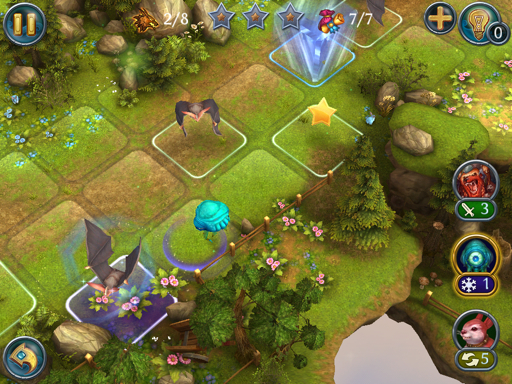 In the first level, we used only one monster a werebear which can defeats enemies in 3 tiles in front of its. This one is include in green monsters category. In the second level, you also unlock your second monster, evil-eye, this monster has ability to unfrozen one enemy. After that, you should beat that enemy using your regular or green monster. Evil-eye includes in blue monsters. In the third level, you will unlock the yellow monster category, for your first yellow monster, you will get Sabertooth-Squirrel, it can switch the enemy's position though it's a frozen enemy. So, by using these 3 monsters, you must defeat all the monster to pass the level. There are 3 stars too that you must collect to unlock or ”tame" the enemy in that level you played. 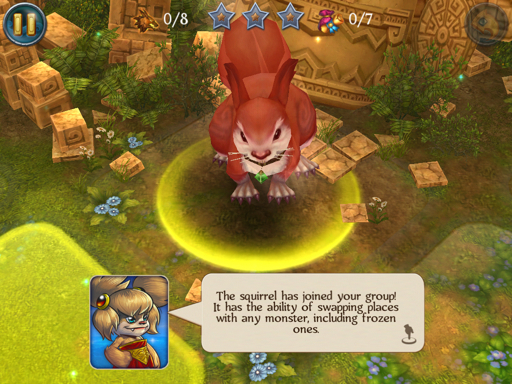 Actually, after you tamed it, you can't used the monster which u have tamed, it just for collection and unlock achievement on Game Center also for leaderboard score. Remember, every monster has limited movements, so use it wisely. Some levels only have one way solution too. Fortunately, you can pass any level without collecting any stars, the requirement is defeat all the enemies only. However, sometimes you can stuck in a level because you can defeat all the enemies but not collected all the stars. You can use hints on the right top for help you decide the movements. Unfortunately, there's only 10 hints, which we got and if you want to use more hints, you must buy it by IAP. Hmm... This one is optional choice only. 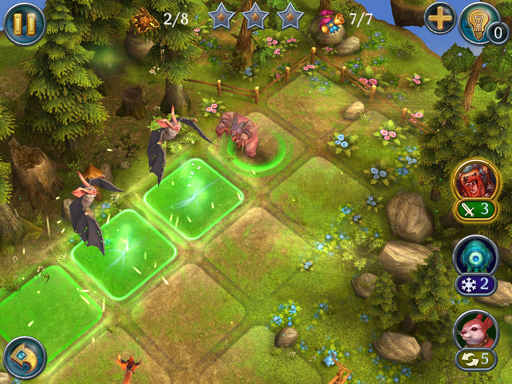 One more, you are not always get the same monsters to defeat the enemies for every level. So far I play, I got 4 monsters in green category, 2 in blue and yellow category. Oh, FYI , some enemies has unique skill to like explode which can affect the other enemies which nearby its. 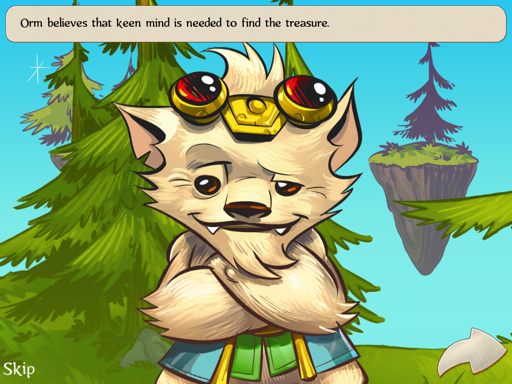 Don't forget to collect treasures in a level to unlock the historical scroll (Allod's Online Wallpaper). Overall, there are 21 main levels in 4 stages, 3 bonus levels, and 5 new levels which you can purchase by IAP cost $0,99. See the video below, for make sure how the gameplay is... Have fun!